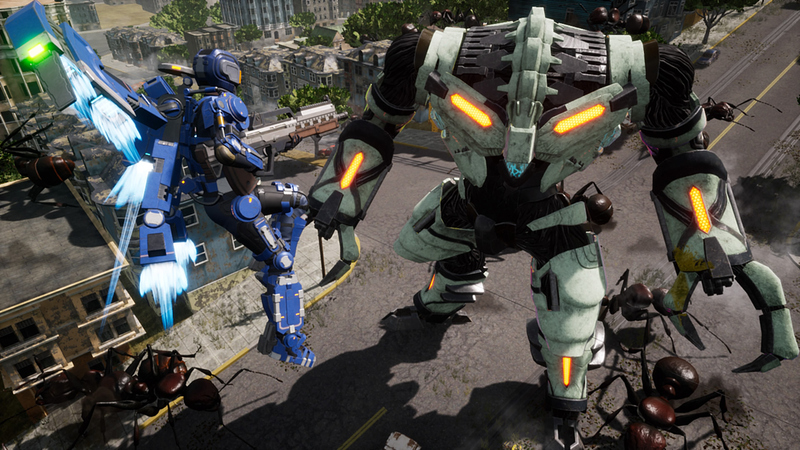 Earth Defense Force: Iron Rain has been released on PlayStation 4, meaning players can load it up and destroy giant alien bugs and robots to their heart's content. Iron Rain isn't the first Earth Defense Force not to be developed by series mainstay Sandlot, but it does represent a recent shift in the series. D3 Publisher enlisted WWE 2K developer Yuke's to provide a new direction for the franchise, with a focus on a different audience. Iron Rain offers players a whole new class, the Prowl Rider, and several gameplay changes, like the ability to equip any weapon with any class. 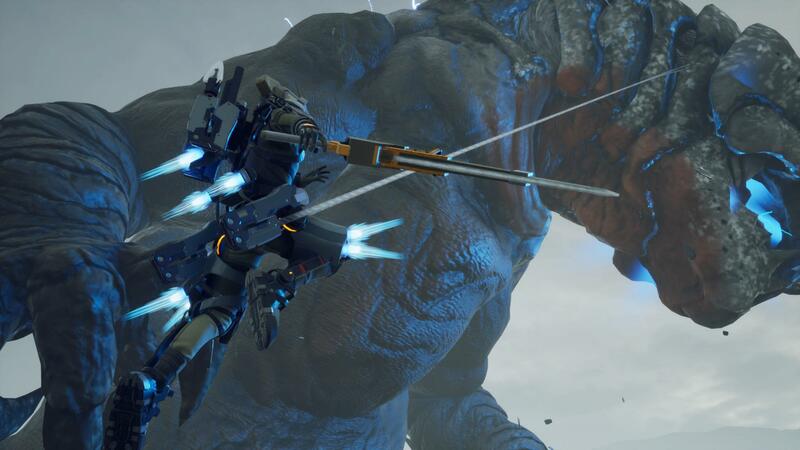 At PAX East 2019, USG spoke to Earth Defense Force producer Nobuyuki Okajima about everything that went into Iron Rain, and what they hope the new spur of the franchise will do in the future. USG: It's rare that you let other developers outside of Sandlot handle Earth Defense Force. How much freedom did you give Yuke's to create Earth Defense Force: Iron Rain? Producer Nobuyuki Okajima: [Earth Defense Force: Iron Rain] is completely different; another EDF rather than a spin-off. For the numbered EDF series, it's been around for 15 years. It's very popular in Japan, but worldwide it's more of a cult favorite. We would like to expand that and that's the focus of Iron Rain. Particularly, we're focused on the Western users. The location is different; the numbered series is in Japan, but Iron Rain is in San Francisco, Los Angeles, or Arizona. Somewhere where Western users can feel like it's related to them. System-wise, it's different as well. The numbered series has 15 years of history, so system-wise, it's hard to change. Iron Rain is trying to get closer to modern users and third-person shooters. USG: How was it reimagining those U.S. locations in the EDF style? NO: We didn't have much of a problem with the location changes. For Iron Rain, we picked Yuke's. They know the Western users and what they want. There was not much in the way of challenge there. USG: I noticed an attempt at a change in tone. Earth Defense Force is very B-movie, but part of Iron Rain feels like it's trying to be more realistic. NO: Exactly. I love the monster and creature films, but the numbered EDF is Gojira, while Iron Rain is Godzilla. USG: How hard has it been to make the classes remain distinct, given the changes to weapons, allowing any class to use any weapon? NO: We did that for the Western users. They like more freedom. The numbered series does have freedom, but within a limited range. We figured the Western users would like more freedom with almost no limits. Another change we made was the competitive multiplayer combat mode. We didn't have that in EDF before, but we believe that Western users will love it. USG: The Prowl Rider is a wholly unique addition in Iron Rain, a class that can get around with its grappling hook and even ride on enemies. Where did that concept come from? NO: When we were making Iron Rain, we retained some of the basic classes from the numbered series: Trooper, Jet Lifter, and Heavy Striker. We couldn't exclude them, but we also wanted to have some unique, new and surprising classes. So we came up with the Prowl Rider. It's the combination of Spider-Man and a ninja, but it's like a dragon tamer as well. You can control giant ants! When we came up with that concept, the creators at Yuke's and I were very excited. We thought users would love it. USG: Speaking of character customization, it's a great, flexible feature in Earth Defense Force: Iron Rain. Can we expect to see some of Iron Rain's features coming back to the numbered entries? NO: We're not focusing much on the overlap between all our users. The numbered series is very popular in Japan and it's going to be great if people play Iron Rain in addition to the numbered series. But the game style is very different, so we think they'll develop in very different ways. USG: Iron Rain has fewer missions overall, compared to the Earth Defense Force 5. Was this intentional? NO: Right now, Earth Defense Force 5 has over a hundred missions, while Iron Rain has only around 50. The numbered EDF games actually started with around 30 missions. Iron Rain may eventually take the same steps as well, but we didn't think about competing with EDF 5 in terms of the number of missions. USG: For veteran Earth Defense Force fans, how will the new top-end Disaster level difficult compare to the old Inferno? NO: It depends on the individual, of course, but I think that for most people if they play on say, Easy mode, they may think Iron Rain is a little more difficult. *Okajima lays out the difficulty levels of EDF 5 and Iron Rain with his hands, showing that Iron Rain's difficulties are on a smaller range, higher up in difficulty overall* Disaster is beyond Inferno in the numbered series. USG: What about Earth Defense Force: Iron Rain, or any EDF for Switch? NO: It's not going to happen with this one. It's a common question. There are trade secrets and we don't want to say that we're developing Earth Defense Force 6 already. Tagged with Action,	D3 Publisher,	Feature,	PlayStation 4,	Sandlot,	Shooters.